It may have come as a shock to Sen. Dan Soucek to have George S. Robinson file to run against him in the Republican primary for the Dist. 45 NC Senate seat. We were surprised but not totally shocked, since we had been hearing for months -- through Caldwell County Democratic channels -- that the Republican Party in Caldwell was very dissatisfied with being added to Mr. Soucek's district and was looking for someone credible to challenge him in the primary. We didn't take those reports very seriously, thinking it unlikely that Caldwell would so noticeably step out of line. Not only did they find a credible candidate. They found in George Robinson an A-List candidate with plenty of experience. Mr. Robinson was a member of the North Carolina House for two terms, 1980-86, 1988-96; he stepped down in 1986 to challenge Rep. Cass Ballenger in that year's Republican primary for the U.S. Congress, 10th District, which of course he didn't win, but he's a man who clearly doesn't mind challenging the status quo. Hmmm. 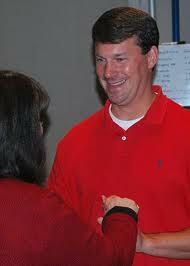 The Caldwell County Republican establishment is trying to take out Dan Soucek. And here's the thing: Caldwell County is now the population center of the newly drawn 45th senatorial district. Caldwell County alone accounts for 45% of the voters in the new district. Soucek has been a weak fundraiser: he currently, in his last finance filing with the State Board of Elections, reported about $20,000 on hand. Robinson will no doubt be able to raise big money. He's a businessman, he's tied in to Chamber of Commerce types, he's a known prestige candidate. The open question awaiting an answer: how will Soucek's millionaire backers down-state, the ones who won the seat for him in 2010 by trashing the reputation of a good man and who have told Soucek how to vote for the past year -- will those Big Money-Bags come rushing to Soucek's primary-endangered future in the NC General Assembly? Or will they sit it out and wait to see who survives (seeing as how they're philosophically aligned with the "survival-of-the-fittest" social Darwinism of the 1920s). Dan Soucek may turn out to be a one-termer. Of the whole article, I like the last line the most. What is probably more important is that Watauga Democrats are not likely to be represented by a Wataugan OR a Democrat for a long time to come! These new districts eliminate any chance for a Dem for District 45 - and with Caldwell having such a population advantage, Caldwell favorite sons will prevail eventually! I am planning to switch my party just to vote against him in the primary. Think if more democrats did the same! George Robinson will defeat Soucek. The simple fact that Robinson is taking on this incumbent in a Republican stronghold tells you that there is a lot of dissatisfaction in the GOP with what is happening in NC legislative politics and Soucek with his Anti "anyone who isn't like me" Amendment One ballot imitiative has been bad for business in NC. Soucek, the heir apparent to the Foxx Congressional seat, may see his political career ending this May. I laugh when old JW attempts to discuss inside Republican politics. There are serious problems with George in Caldwell County. Like what is the status of his business, his health, his social skills? Have things changed in his life? Sorry all of you Dan Soucek haters, he is going to be with you for a very long time. You are way out of the belt way on this one. I looked at the NC Board of Elections web site and did a quick calculation on party affiliation in the new 45th District: 32% Democrat, 42% Republican, 26% Unaffilated. So while it might be difficult to elect a Dem, it's not impossible. With a good candidate who can appeal to those unaffilated voters, good voter turnout, and the weaknesses of Senator Dan, we have a chance. A chance as good as a snowball in Hell. Better watch out, there. Many a politician has been so over-confident and sure of their victory that they didn't even bother to campaign, and then ended up losing to a better organized and efficient opponent. Nothing is impossible in politics! As bettywhite said, it's going to be difficult, but not impossible, for a Dem to win in the 45th. Dan Soucek is well respected throughout the state as a strong conservative. Caldwell County is very happy gain a man of such great credentials to represent us in Caldwell County. Our current NC Senator Warren Daniel is also an excellent new Senator that will be missed, but the Senator trade is equal. Both Warren and Dan are West Point graduates. Dan Soucek is a retired Army officer, Cobra helicopter pilot, Samaritan's Purse -Operation Christmas Child -Logistics Director for Asia and Africa, and was a value part of the GOP sweep of the NC Legislature. He will be missed by the counties he is leaving and very welcomed into his new district. Please talk to Republicans in his current district before you listen to the comments here, Dan Soucek is very effective and well loved. Caldwell Republican Club proudly endorses Dan Soucek's NC Senate campaign.